A brawl broke out at Seattle Seahawks training camp on Thursday. At the center of everything was third year defensive end Frank Clark, who got kicked out of practice. According to reports, Clark punched right tackle Germain Ifedi, who didn’t have his helmet on at the time. After being hit, Ifedi went to the locker room and ended up missing the rest of Thursday’s practice, while Clark was asked to leave practice for the rest of the day. The initial scuffle began as a shoving match between offensive lineman Will Pericak and defensive tackle Rodney Coe, leading to a scrum involving players from both sides of the ball. The matter between the two appeared to be resolved. However, Clark and Ifedi continued to exchange words until Clark punched Ifedi, causing him to fall to the ground. At that point, several other players rushed to the scene to help prevent any further nonsense. Eventually, Clark walked into the locker room, accompanied by an assistant coach. In the past, Carroll has overlooked such scuffles between teammates during training camp. However, he took a hard stance on Thursday’s incident, perhaps because a punch was throw at the team’s first round draft pick from 2016. When asked about Ifedi’s status, Carroll said he was fine, so it doesn’t appear like he suffered an injury that will keep him off the practice field beyond Thursday. There were no other incidents the remainder of the team’s practice. 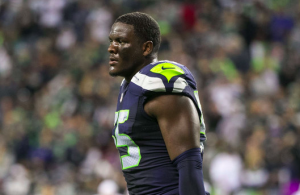 Both Clark and Ifedi appear to be important parts of Seattle’s success this season. Ifedi is pencilled in as the starting right tackle, and the Seahawks are hoping he can take a big step forward in his second pro season. Clark, meanwhile, is coming a season in which he accumulated 10 sacks for Seattle’s defense. The Seahawks expect him to once again be a productive member of their defensive line in 2017. There’s no word on whether Clark will face any punishment beyond getting kicked out of Thursday’s practice. Clark’s past indicates that he has a bit of a temper. He was arrested for domestic violence in November 2014 and subsequently kicked off the Michigan football team. Clark was also involved in a scuffle with offensive lineman Luke Joeckel during Wednesday’s practice. However, it appears that Seattle’s veteran players are ready to turn the page on the incident. Veteran defensive lineman Michael Bennett has chalked it up to 90-degree temperatures and preseason intensity. Scuffles and scrums do tend to happen during NFL training camps. But they don’t always involve punches being thrown or players getting kicked out of practice. Some of Seattle’s players appear ready to squash the issue. But whether Carroll is willing to do the same remains to be seen.